Quick and easy chocolate chip cookie dough truffles, requiring simple ingredients. These no bake eggless cookie dough truffles and ready in 30 minutes. 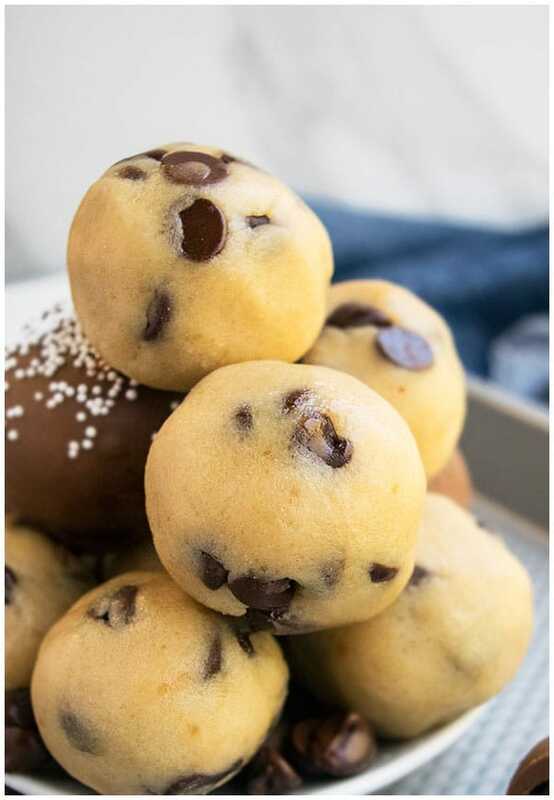 Like most people, I enjoy cookie dough more than the actual cookies and these cookie dough truffle balls are just bite sized cuties that I can’t get enough of! I recently tried a recipe for chocolate chip cookie dough truffles with cream cheese and I didn’t like since it was a bit tangy. I can’t understand why people like it so much because hands down my Mom’s recipe is much better! My family and friends request this A LOT during Christmas time…hehe. For the holiday season, make candy cane cookie dough truffles by dipping the truffles in melted chocolate and then garnishing with some crushed candy canes. For a nice chance, you can make m&m cookie dough truffles by replacing chocolate chips with m&m candies. This is a favorite among kids, especially at birthday parties. 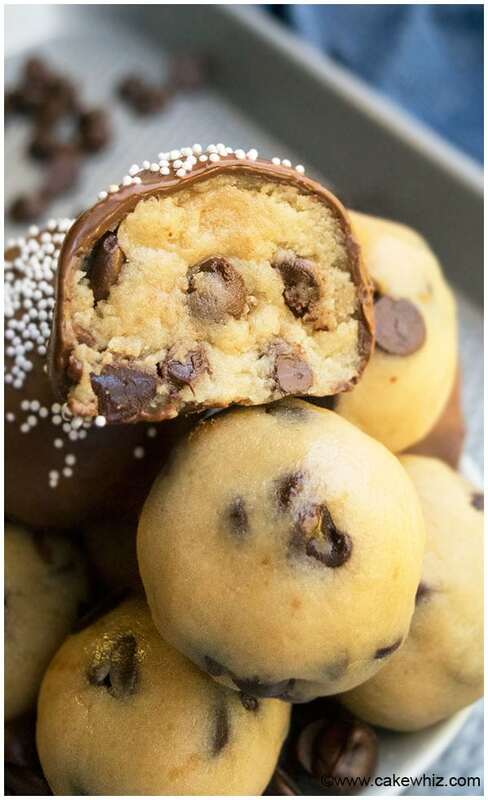 If you like the sweet and salty flavor combination, make cookie dough truffles with sea salt by dipping the truffles in melted chocolate and then garnishing with a sprinkle of high quality sea salt. 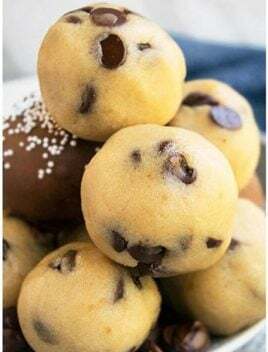 For vegan cookie dough truffles, replace regular milk with soy milk, almond milk or coconut milk and replace butter with vegan margarine and replace regular chocolate chips with vegan chocolate chips. 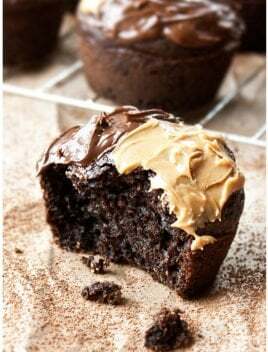 To make them a bit healthier, replace granulated sugar and brown sugar with coconut sugar. 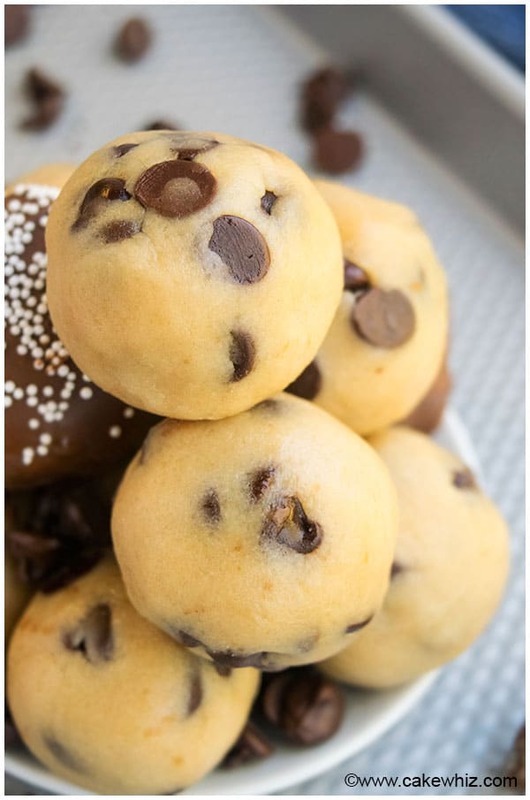 For gluten free cookie dough truffles, use gluten free flour instead of regular all-purpose flour. To make easter egg cookie dough truffles, shape this dough into oval egg shapes rather than balls and then dip them in chocolate and cover them in sprinkles. Use UNSALTED butter since salted butter makes these truffles very salty. You can use mini chocolate chips or the regular sized ones. DON’T add too much milk because that will make the dough very sticky. If the dough ever becomes too STICKY to handle, chill it for about an hour, which will make the rolling much easier. Use the BEST quality chocolate chips you can find because it really enhances the overall flavor of these truffles. How to make cookie dough truffles? 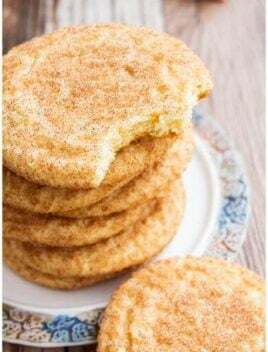 How do you make eggless cooke dough? How do you make chocolate chip cookie dough balls? Start off by mixing together butter, brown sugar, granulated sugar and vanilla. Then, add flour, milk, chocolate chips and mix until just combined. Scoop out small portions of the dough and roll into balls. Dip them in melted chocolate and toss some sprinkles on top of each truffle. 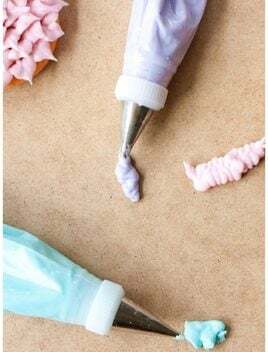 Place them on a sheet of wax paper and when the chocolate sets, enjoy! How do you make cookie dough cake pops? Dip the end of lollipop stick in melted chocolate and then push it into a cookie dough ball. Refrigerate for 5 minutes and then dip each pop in melted chocolate. 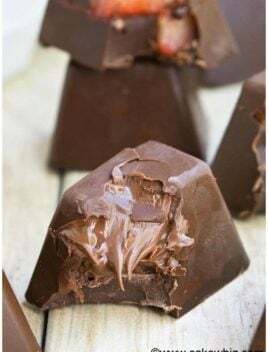 Place on a sheet of wax paper and refrigerate for 15 minutes or until the chocolate sets. How long do cookie dough truffles last? How long will cookie dough truffles keep? Keep them refrigerated in a sealed container for up to 3 days. Can you freeze cookie dough truffles? Yes, you can freeze them as long as you don’t dip them in melted chocolate first. 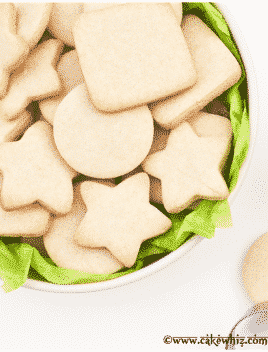 How to make raw cookie dough safe to eat? These truffles are totally safe to eat because they are made WITHOUT eggs. If you are really concerned about the flour being contaminated and unsafe, you can bake the flour at 350 degrees for 5 minutes and that is supposed to “pasteurize” it. Do cookie dough truffles need to be refrigerated? Yes! Since milk is used, they need to be refrigerated. 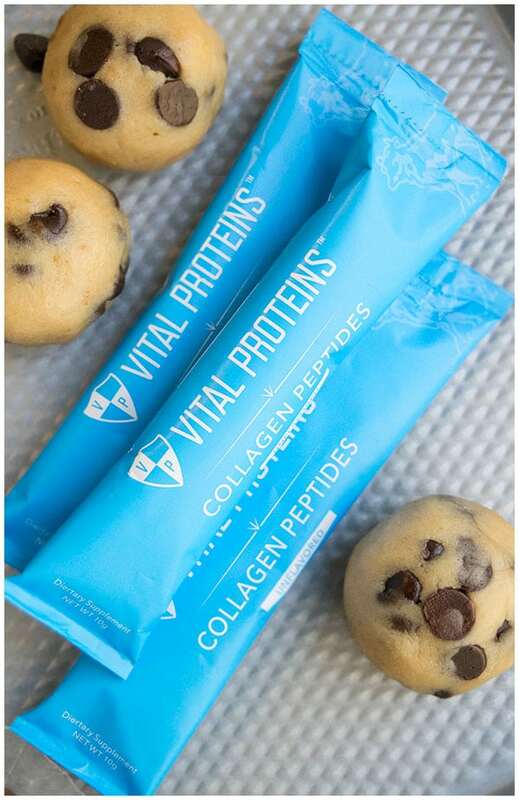 I added a packet of Vital Proteins collagen peptides into the dough to give it a boost of nutrition. That doesn’t obviously transform these truffles into energy balls (lol!) but I feel like I have a mommy win when I sneak something healthy into a recipe. Since the powder is colorless and flavorless, he never even knew this protein powder was in there and really enjoyed it! You can also use this protein powder in smoothies and breakfast muffins to start off your day right. In a large mixing bowl, add butter, brown sugar, granulated sugar, vanilla extract and mix until smooth. Add flour, collagen peptides (optional), milk and mix until just combined. Chill the mixture for about 40 minutes in the fridge, if it's hard to handle. 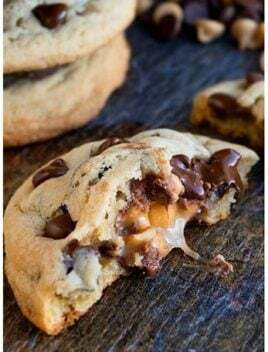 Dip them in a bowl of melted chocolate if you like and place them on a cookie tray, lined with wax paper. Toss some sprinkles and and allow the chocolate to set. Enjoy! For healthier truffles, replace regular milk with soy milk, almond milk or coconut milk and replace butter with vegan margarine and use dark chocolate chips. Finally, replace granulated sugar and brown sugar with coconut sugar. You can just omit it or replace it with some extra flour, if batter is hard to handle. If you eliminate thhe protein powder, does anyrhing else need to be adjusted? You might need to add about 1-2 tablespoons of additional flour. Otherwise, nothing needs to be changed.